Our Mend Our Mountains partner The Outdoor Access Trust for Scotland (OATS) is helping to mark the start of the path restoration appeal � at the same time as celebrating the halfway point on their own flagship project, The Mountains & The People. 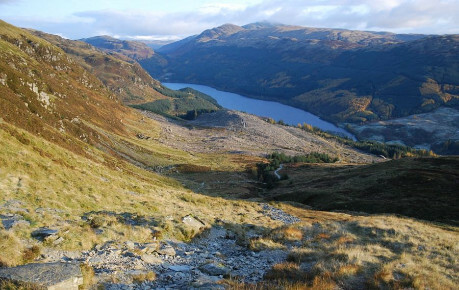 They�re inviting people to take part in an informal family walk in Ben Ledi in the Trossachs, on 15 April, using a path recently repaired by the Mountains & The People project. As well as enjoying the climb and the views, people will also have a chance to find out first hand from those involved in conserving the mountains what it takes to repair our mountain paths and the fun that can be had on the way. The event will also help publicise the launch of the Mend Our Mountains fundraising campaign, which is looking to raise �100,000 to improve two iconic mountain paths on Ben Vane in Loch Lomond and Beinn a�Ghlo in the Cairngorms. During the day there will also be a prize draw, with the chance to win from a selection of limited edition Gore-Tex clothing including walking shoes and jackets. The family walk is a free event, starting at 10am at the Ben Ledi car park, Callander. There�s only limited car parking there, so participants are recommended to park at the Forestry Commission car parks in Kilmahog or the public car park in Callander. A free shuttle bus will run from each car park to the start of the walk and back throughout the day. The distance involved is 9km, although people are under no obligation to complete the whole walk. Although there will be marshalls at the start, mid-way and summit points should assistance be required, all participants will be responsible for their own safety and therefore should only walk within their limits. Walkers should be equipped with suitable footwear and clothing for mountain conditions. The event is free, but donations and sponsored participation is welcome. Check out the OATS website for more detail. More details of the route up Ben Ledi. Looking back to Loch Lubnaig during the ascent of Ben Ledi. Photo by Walkhighlands.